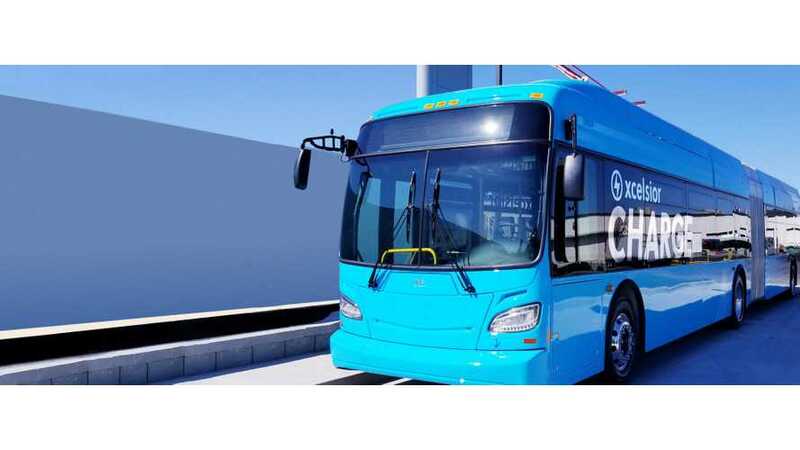 New Flyer received order from the Massachusetts Bay Transportation Authority (MBTA) for 5 sixty-foot articulated Xcelsior CHARGE electric buses. Each can take some 120 passenger. The buses will be utilized on the on Silver Line routes to demonstrate EV technology. We can only guess that if those new, articulated buses will meet expectations, MBTA will order more. New Flyer benefits from completion of the Federal Transit Administration’s (FTA) Model Bus Testing Program, which enables to qualify for FTA funding. "The award furthers MBTA efforts to reduce greenhouse-gas emissions while establishing safe and reliable transportation for the greater Boston area. The Xcelsior CHARGE™ buses will be used to demonstrate battery-electric vehicle technology on Silver Line routes. The project, which includes charging infrastructure, is supported by a grant through the Federal Transit Administration’s (FTA) Low and No Emission Vehicle Deployment Program (LoNo) and is a result of a partnership between New Flyer, MBTA, and the Center for Transportation and the Environment (CTE).As previously announced, New Flyer’s sixty-foot battery-electric transit bus is the first and only sixty-foot battery electric bus to complete the Federal Transit Administration’s (FTA) Model Bus Testing Program, qualifying it for FTA funding."